2. QC 3.0 USB Port (Orange) Output 5V/9V/12V 15W Fast charging for Quick charge tablets and smartphones. 3. USB A Port (Blue) Output 5V Max 12W Charge for tablets, smartphones and more 5V USB Charging Devices. 90W USB-C Charger size: 5.0 inches (L) x 2.6 inches (W) x 0.7 inches (H) Weight: 9 ounces. 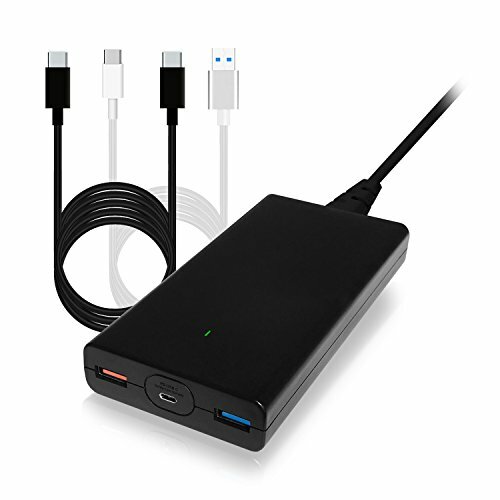 Packing list: BatPower 90W Universal USB C Charger Ac Adapter, Type C Charging cables, AC Power Cord, Instructions Manual.